I’m from New Orleans…the land of Mardi Gras, good food, and Saints football. American professional sports are fascinating pastimes. When I was a kid, the New Orleans Saints were frequently dubbed the “Aints”. People couldn’t get give away their seats and often “fans” wore bags on their heads to express distaste in the teams’ lackluster performance. As a native to New Orleans, it’s hard not to stick with this team. Malcolm Forbes says …Victory is sweetest when you’ve known defeat. The city has been through plenty of losses. In the 1990s, the oil industry picked up and moved to Houston. In 2005, Hurricane Katrina decimated the city with a slow recovery, and then the Gulf Spill in 2010 brought the area more challenges. If there’s anything I know well about my hometown is we know how to put up a good fight, we have spirit, and most importantly we “believe”. When you believe you are more than half way there. Nothing is impossible when you believe. It’s about grit…determination…an unwavering focus on the prize. I read an interesting article last week I picked up Facebook about the Saints belief in their ability to play better football with the help from a bucket of New Orleans original Popeyes Fried Chicken. Ridiculous, perhaps? It worked. That’s BELIEF in action! And… Popeyes is taking credit for this weekend’s win. A word about non believers…. there are many of them. Ignore them. You don’t need them to fill your seats. In football we call these “bandwagon fans”. They only get on board when it’s clear a victory is in site, or they posses temporary belief. When seasons get tough, they sell their tickets. Real fans. Real believers show up, get louder, and more resolved to win. The Saints won the Superbowl in 2010. This weekend’s win was dubbed the grittiest since then. And they will continue to win because they possess the power to believe. Thanks for your belief in me and my blog. Thanks for reading it, commenting, and connecting others to it. If you have a few minutes, I’d really appreciate your feedback so I can improve it. The survey closes this week. Leave your contact info and I’ll donate to charity or buy you a cup of coffee for your participation. 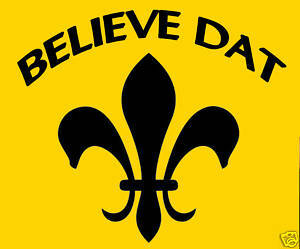 Geaux Saints and GO YOU!